The Indian music industry went through a reformation in my personal opinion in the last few years, and going back to it after a small break I was able to appreciate a lot of the new work. The opportunities for new talent has proven to be a great thing, and I for one have really enjoyed it and taken it as a new movement towards the better. Starting with Naresh Iyer doing a tremendous job with Rubaroo and for a change being lauded highly for it, there have been new voices, new faces, and new music on the scene. I especially like the fact that established music directors are willing to take chances…I mean, I loved Shankar even before he began experimenting widely, but I love him even more for that. Rahman has always been an experimenter, and he has the talent to do it well. The new atmosphere I think gives him even more room, and his new albums have all been proof to that. Ada had tunes that were very Rahman, and some that were very different, that you needed to give time to sink in. Same with Jaane Tu, which some die-hard Rahmaniacs still choose to look over and avoid talking about 😉 I am as loyal to him as ever, but I’ve opened up and am more welcome to the latest work by directors like the young Vishal-Shekhar duo (thank you for beginning to sing yourself too in your tracks, btw). The pop/folk scene has changed to, and begun to accept that it can only go so far in false clothes: Hindi cannot and should not be a rap language. It just doesn’t work. But that doesn’t mean there aren’t other realms we can expand into, right? Rabbi’s been popularizing a new type of modern rock, and Kailash Kher has been taking us back to the earthy, folksy, rich tones, but with a twist each time. Me likes. Most of Dostana I’m quite pleased with. I’m sure the majority loves Desi Girl which is a fun enough track (and reminds me of Shankar’s music, not just because he’s singing), but I’ve built quite a liking to the other tracks. *Shaan does a sad song? Shaan’s voice is always smiling, so Kuch Kum has this feeling to it…like someone is trying to smile through pain. Lovely touch. **Um, Vishal Dadlani, can you tell me why you weren’t singing happy-bubblegum-upbeat-falling in love songs before? And also, can you please tell Shekhar to start singing to some of his compositions too? As long as you don’t take it too far like a certain nasal music director turned singer, I’d really like to hear more of those voices. Please to oblige. Thanks. *Firstly, the lyrics really attracted me, and then the touch with which Benny Dayal goes “Tu hi to meri dost hai…” Its a very unorthodox song, unpredictable on the twists it takes. I really love the idea behind using the word dost. **Feels like ages since I’ve heard Srinivas. Also heard repeatedly: Alex’s Saranghaeyo, highly because of the instrumental parts, and Epik High’s One Minute One Second. Is there any limit to Tablo’s genius? I hope not. Oldies I’m going back to: Naina Barse Rhimjhim, for its eerie beauty, and Baat Niklegi because you can never have enough of a good ghazal. PS: While we’re on it: any recommendations? Because this is difficult Urdu for me, a lot will be lost in translation, and there are certain words that even I had to hunt. But hopefully some one out there will still appreciate it, because a lot of people stumble here looking for Jagjit Singh’s translations (I’ve posted some ghazals before, organized under categories). Please let me know if you have any alternate suggestions/thoughts about my translation or just about the ghazal itself. Its just so beautiful…short, but quite, quite lovely, especially in Jagjit Singh’s wonderful voice. The translation itself may not make as much sense if you don’t get the gist of the song or the feeling behind it, or understand the voice of the writer. The wonderful thing about ghazals is that they may be interpreted so many different ways. My own analysis of this piece is as follows…it is a poem of admonition, where a lover warns his beloved about how the world will never understand their love. When the word (baat) goes out (niklegi) it will spread like wildfire (door talak jayegi), rumors and gossip about their relationship will be tossed around, it will be the talk of the town, but no one will understand. We learn that she is seperated from him, that this separation is painful, visible by the way she has stopped to take care of herself, stopped to do her hair, wash her face, visible by how she has aged, by the bangles she wears. And people, they notice all this, they conjecture on it, they gossip about her and her condition and the reason behind it, they may taunt her, be cruel to her by noticing all these faults and asking her persistently. They may bring up his name in conversation just to see her reaction for their own entertainment. But, he warns, don’t be dragged into it…don’t answer back, or question, or argue, or let it show on your face how much you love me. If you say anything, the expression on your face will give it all away, so be quiet, and bear it, and don’t talk about me with anyone. Because once the word gets out…it will go too far. Feel free to post elswhere, but credit moi. Baat Niklegi To Phir, by Jagjit Singh. Written by Kafeel Azar. (The song above talks about a person’s struggle to feed his family. Jagjit Singh sings of how now he wanders the ration stores for food, suffering the punishment for leaving his fields. The first stanza describes that he buys some little food from the expensive markets, and is ashamed to have to distribute even that among his children. This song is one of many touching, beautiful ones on a very old compilation Jagjit Singh released in conjunction with CRY, Child Relief and You (link above)). My brother just sent this email (in quotes) to friends and family forwarding a news article in BBC about the state of the malnutritioned children in MP, India. It is one of many describing the horrible affects of the international food crisis. How much have YOU really contributed to the poor of India? How often do you claim to be a PROUD Indian, happily living in the USA, your adopted country? How much have YOU given to the poor of India? How much of their welfare is really in the hands of MISSIONARIES AND FOREIGN givers? The article is simply written and factual, yet its story struck me hard enough to make me literally cry. Mainly this line: “The children ate it, then sat hoping for more, but there was none.” It reminds me of a scene during this visit which was heart wrenching to observe. In Delhi we went to a popular shopping enclave. My family shopped at a cell phone store and I sat near the entrance. It was quite late in the evening. The store was near a mandir (temple) and some big family must have done some puja and were handing out prasad (offering). A small group of very poor people huddled in front of the gates…with dark, streaked skin, torn, tattered and greasy clothing, arms stretched out, eyes shining in anticipation of the food to come. 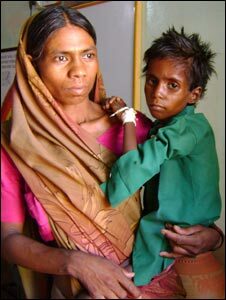 The group included 3-4 children, ranging from eight to four (perhaps they were older, stunted by improper nutrition). Puri and aloo sabji (bread and potato curry) were handed out in small bowls made out of leaves, the norm for such events. The children grabbed their bowls with excitement and gratitude. One ravenously bit in and ate with gusto. He was clearly famished and could see nothing but the food in his bowl. Another broke off each piece of the bread slowly, savouring each bite. Another child picked up his bowl and settled on the pavement, next to the sewage ridden gutter. Inside the store was a large television, visible from the street. The child sat at an angle so he could see the television (just the flashing images was enough), and relished his share. A hungry dog wandered at a dangerous distance. Piles of dung dotted the same pavement, flies and mosquitoes hovering around the food and the children. After a little while, the bowls were empty. The children were still hungry. Their eyes looked appealingly at the temple gates, hungry and sad, wondering if there would be more. They didn’t stretch their arms out again, didn’t cry out for food, but they sat there for a long time, hopeful for another morsel. That food, that small meal, was a luxury, a rare experience, and they longed for just a little more. A little more to fill their stomachs and comfort their small, malnutritioned bodies. Kabhi Yun Bhi To Ho…. Note: The beauty of ghazals is always lost in translation…..